​﻿Published by Sareth Ney on June 6, 2017 at 9:29 p.m. Updated on June 6, 2017 at 9:46 p.m.
SACRAMENTO, Calif. – Monster Energy Aftershock have announced the lineup for 2017. It will take place on Oct. 21 and Oct. 22 at Discovery Park. There will be three stages and there will be over 35 artists on the bill. 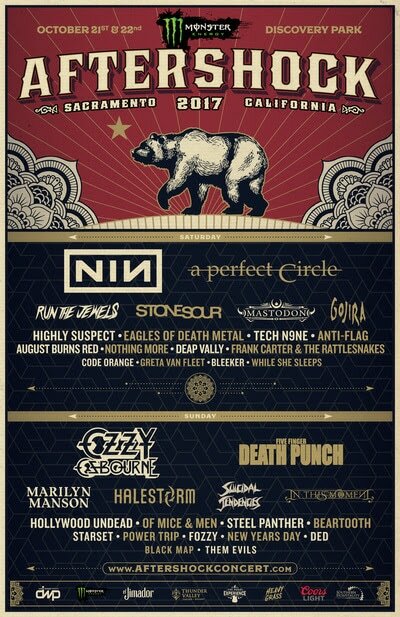 Performing at Monster Energy Aftershock on Oct. 21 will be the following: Nine Inch Nails, A Perfect Circle, Run The Jewels, Stone Sour, Mastodon, Gojira, Highly Suspect, Eagles of Death Metal, Tech N9ne, August Burns Red, Anti-Flag, Nothing More, Deap Vally, Frank Carter & The Rattlesnakes, Code Orange, Greta Van Fleet, While She Sleeps and Bleeker. For Oct. 22’s lineup of Monster Energy Aftershock, the following are set to take the stages: Ozzy Osbourne, Five Finger Death Punch, Marilyn Manson, Halestorm, In This Moment, Hollywood Undead, Of Mice & Men, Suicidal Tendencies, Steel Panther, Beartooth, Starset, Fozzy, Power Trip, New Years Day, DED, Black Map and Them Evils. “Over the past five years, Aftershock has continued to grow as one of the most diverse rock experiences in America,” Danny Wimmer (Monster Energy Aftershock founder and producer at Danny Wimmer Presents) exclaimed. Since forming in 2011, Monster Energy Afteshock’s economic impact exceeded $10 million for Sacramento, Calif. In 2016, they donated $10,000 to Stanford Settlement and festivalgoers contributed $40,000 to charities. Sponsors of Monster Energy Aftershock consist of: Monster Energy, Coors Light, The Music Experience, Thunder Valley, Take Me Home, FxcK Cancer/Dyin 2 Live, Heavy Grass, BlackCraft Cult, El Jimador, Ace of Spades, Roadrunner Records, Century Media, Razor & Tie, Caduceus Cellars, Merkin Vineyards and Juxtapoz. Tickets to attend Monster Energy Aftershock will go on sale on June 9 at noon Pacific Time. The four tiers and prices are as follow: weekend general admission is $149.50, weekend Very Important Person (VIP) is $279.50, single day general admission is $84.50 and single day VIP is $154.50. General admission ticket four packs and Zippo VIP 2 packs are set to go on sale on the same day. Spectators are encouraged to purchase early, as the prices will escalate as the dates draw near.